Cultivated Truffles in Napa: Next Big Thing? Are cultivated truffles the next big crop in Napa? Some people think so. 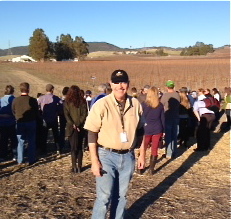 I attended the 2-day scientific seminar aimed at providing an overview for the opportunity to grow and harvest truffles in the Napa Valley. Not a get rich quick proposition, because the initial harvest takes about 5-7 years. Robert Sinskey Vineyards, is an early truffle growing adopter, although a couple of years away from his first harvest. He has 1 acre planted with dedicated truffle trees, situated in his 200 farmed acres in Carneros, CA. The American Truffle Co. is a pioneer in the field of cultivation and production of truffles and Sinskey is client-partner, providing the site for the interesting truffle-hunting dog and harvesting demonstration in his orchard yesterday. The process involves planting specialized trees, either English oaks or hazelnut saplings. The roots are prepared by inoculating them with 2 types of truffles. The American Truffle Co. uses Tuber Melanosporcum, the black Perigord truffles, which can fetch $1,200 per pound and Tuber Aestivum, the Burgundy truffle, selling for less at approximately $700 per pound. While various business models are in their infancy for rolling out the cultivation and harvest of domestic truffles, the Napa Valley seems to be ripe to lead the pack on growing this exotic and most expensive food crop in the world.